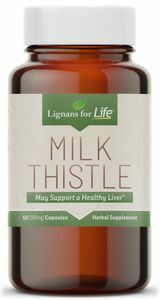 Milk Thistle Liver Support For People or Dogs 100 mg milk thistle. 60 vegetarian capsules. 60 servings. Milk Thistle is found in Europe, the Middle East and North Africa. Milk Thistle belongs to the daisy family and has been used for protection of the liver for thousands of years. Silymarin, a component of milk thistle seeds, or milk thistle extract, is a flavonoid that provides antioxidants naturally. Our milk thistle supplement contains 100 mg of milk thistle, standardized to 80% silymarin. Each bottle contains 60 capsules. Our milk thistle for dogs can be used by people or pets. Research suggests that Silymarin (the flavolignans removed from milk thistle) and its antioxidant properties can be beneficial for dogs (5). Studies also suggest that milk thistle may support a healthy liver in dogs. Milk Thistle can be beneficial for dogs with Cushings Disease (a common adrenal disorder), as liver problems are often associated with the disease due to the stress it places on the liver. How much should I give my dog? Recommended dosage for healthy dogs is approximately 2 mg of milk thistle for each pound of dog's weight. For dogs with elevated liver enzymes and/or in need of extra liver support, you may give up to 10 mg per pound of body weight. Please consult your vet for dosage suggestions. For dogs under 25 lbs, give 1/2 capsule per day. For dogs 25-50 lbs, give 1 capsule per day. For dogs over 50 lbs, give 1 1/2 to 2 capsules per day. Capsule can be administered whole using peanut butter, cheese, a pill pocket, etc. or capsule can be opened and sprinkled on dog's food. How much should I take? Recommended dosage for people is 1 capsule two to three times daily with water. What are the Benefits of Milk Thistle? Milk Thistle has been studied for its antioxidant properties that may support the liver(1). Other reported benefits of silymarin and milk thistle include their anti-inflammatory properties, which may support cell structure. Studies also imply that the active ingredients in milk thistle may support skin health. Another product to consider is our SAMe. Oftentimes SAMe for liver support is used in conjunction with milk thistle for added benefits. Are there any side effects of Milk Thistle? Very few side effects have been reported after using milk thistle. In rare cases, it may have a laxative effect, but such instances are uncommon. It is always important to consult your doctor or physician before starting any new supplement. 1). Asghar Z, Masood Z. Evaluation of antioxidant properties of silymarin and its potential to inhibit peroxyl radicals in vitro. Pak J Pharm Sci. 2008 Jul;21(3):249-54. 2). Tamayo C, Diamond S. (2007). Review of clinical trials evaluating safety and efficacy of milk thistle (Silybum marianum [L.] Gaertn.). Integrative Cancer Therapies. 3). Joi A. Nichols, Santosh K. Katiyar (2010). Skin photoprotection by natural polyphenols: Anti-inflammatory, anti-oxidant and DNA repair mechanism). Joi A. Nichols, Santosh K. Katiyar (2010). Skin photoprotection by natural polyphenols: Anti-inflammatory, anti-oxidant and DNA repair mechanisms 4.) Gaby, Alan R. (2006). The Natural Pharmacy: Complete A-Z Reference to Natural Treatments for Common Health Conditions. 5.) Varzi HN, Esmailzadeh S., Morowati H. Effect of silymarin and vitamin E on gentamicin-induced nephrotoxicity in dogs. (2007). Journal of Veterinary P5. Varzi HN, Esmailzadeh S., Morowati H. Effect of silymarin and vitamin E on gentamicin-induced nephrotoxicity in dogs. (2007). Journal of Veterinary Pharmacology and Therapeutics. 477-481. Note: Another product to consider is SAMe for liver support. Milk Thistle and SAMe are often used together for added benefits. DISCLAIMER: ** These statements have not been evaluated by the FDA, and this product is not intended to diagnose, treat, cure or prevent any disease. Always consult with your physician before taking any food supplements.